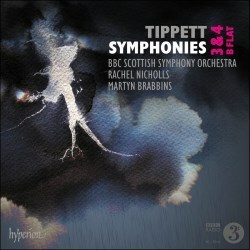 Last year I gave a warm welcome to the new version of Tippett’s first two symphonies under Martyn Brabbins. Now in a convenient two disc package come not only the remaining two numbered symphonies, but also the first recording of Tippett’s earliest, unnumbered attempt at the form. The third symphony is Tippett’s biggest symphonic statement. It has always been considered a problematic work, because of its vocal finale. If that reminds you of early reactions to Beethoven’s ninth, that would be fitting, as Tippett’s symphony is in some ways a deliberate reaction to Beethoven’s. He asked whether in the twentieth century with its many disasters we could still affirm the brotherhood of man, as Beethoven had done, rather firmly expecting the answer No. Still, whatever one thinks about this, I have always loved and admired the first three movements and I shall come to that vocal finale shortly. Tippett divided the symphony into two parts, and each part is effectively two movements. The first movement has headings Arrest, for an abrupt motif in syncopated brass chords, and Movement, for a wildly leaping violin line. (Tippett compared these terms to the pull and thrust of a jet engine but they actually come from T. S. Eliot’s poem Burnt Norton, II. 18.) Right from the start I was delighted by the splendidly assured, confident and accurate playing from Brabbins and his BBC Scottish SO. The violin lines – and this kind of writing comes in much of the piece – must be hell to get tight, precise and exultant, but they are so here, even more than in the earlier symphonies in the previous issue. The themes develop and interchange and then briefly combine before an explosion suddenly takes us into the second movement. This was apparently suggested by a hearing of Boulez’s Pli selon Pli, which Tippett thought very static and an idiom he could use only in contrast to something else, in fact the first movement here. It is quiet and gentle, with a persistent meditative viola theme and prominent roles for tuned percussion and also harp, nicely balanced here so that you can hear it. There is a beautiful, mournful cor anglais line winding slowly upwards at the end. Tippett wanted to avoid what he called the ‘Shostakovich bombast’ associated with finales and decided instead to compose a set of blues, for soprano solo. (He was a great admirer of the blues singer Bessie Smith.) There are three of these, fast, slow, fast, and then a fourth which is really more of a scena. The problem lies not in this conception but in the words Tippett gave his singer, which he wrote himself. Those for the first three are toe-curlingly mawkish, while that for the fourth is so elaborated with melismas that it is hard to make the words out and you need the text in front of you. The first two celebrate vitality, the third brings in pain and the scena is a repudiation of the Schiller text which Beethoven set. Having said that I need now to say that this is the most convincing performance of the work as a whole and of its last movement in particular, which I have heard. Rachel Nicholls really makes something of her often ungrateful and jagged line, and she is particularly well supported in the first slow blues by the first trumpeter Mark O’Keeffe, who for it swaps his usual instrument for the flugelhorn. The fourth symphony, commissioned and first performed and recorded by Solti and the Chicago Symphony orchestra, also has a problem, but of a different kind. Tippett conceived of it as a ‘birth-to-death piece,’ inspired by a film he had seen long before of a speeded up version of a rabbit foetus growing in the womb. He wanted to begin and end the work with the effect of a breath, suggested by Samuel Beckett’s short play of that name, but had difficulty getting it satisfactorily realized. The first performance used a wind machine, which you can hear on their recording and which, unfortunately, sounds like a wind machine. Later performances used a tape effect, and for this new version a new audio sample was prepared, and this is much most satisfactory. The work is in a single movement in an expanded sonata form. That might suggest Sibelius’s seventh symphony, but Tippett’s work is the antithesis of that one: instead of Sibelius’s gradual and imperceptible transitions he has sudden jumps in tempo and texture, apparently suggested by his habit of watching television and channel-hopping. The score calls for an expanded brass section, with six horns and two tubas, and there is also a good deal of tuned percussion. There are three main themes, one for brass marked ‘power,’ one for strings marked ‘vigour,’ and one for woodwind marked ‘lyric grace.’ These recur throughout the work, and there is a kind of recapitulation towards the end. There is a great deal of scope for orchestral virtuosity, and indeed the work could be considered a kind of concerto for orchestra, in some ways resembling Tippett’s own work of that name, with its jagged themes and abrupt transitions. It is, however, far less emotionally complicated than its predecessor, and easy to enjoy. Tippett’s earliest symphony, much worked over and revised, was first performed in 1934 and received several more performances over the next few years. Tippett did not finally withdraw it until the mid-forties, when he was working on the symphony which became his official No 1. This early symphony shows the strong influence of Sibelius, who was very highly regarded in the Britain of the 1930s, and was considered a much better model than the continental modernists such as Schoenberg and Stravinsky. This influence is evident in a number of passages, from the opening, which like Sibelius’s first begins with a clarinet solo, to numerous passages throughout and a rather Sibelian cast of themes and development. There are three movements, with a sonata form first movement, a slow movement and a rondo finale. The work is attractive but rather inconclusive and very much without that strong sense of drive which characterizes Tippett’s mature works. There are only occasional anticipations of the later composer. Still, it is good to hear it and I am glad that the Tippett estate decided to release it. In considering comparative versions, as a Tippett fan I have long cherished the first recording of the third symphony by Colin Davis with Heather Harper and the London Symphony orchestra, who gave it its premiere. However, Brabbins’s conception, though not markedly different, enjoys not only a more recent recording but also a better performance, the wildcat passages for the strings being much more secure in the new version. And Rachel Nicholls does not suffer in comparison with Heather Harper. In the fourth, everyone will enjoy Solti and his orchestra’s exuberant virtuosity, but apart from that wind machine he does tend to be slightly too fast – his performance knocks about five minutes off both Brabbins’s performance but also Tippett’s own. This last is well worth hearing – it comes off rather better than his second symphony, though recorded shortly after it – but is rather subdued. (It is a shame that Colin Davis never recorded the fourth symphony commercially, but his 2005 Prom performance should really be made available.) I regret that my memories of Hickox’s cycle of the four numbered symphonies are too vague to make any useful comments, but it was very well received, is available as a set at a modest price or in the original separate issues with interesting couplings, and for those not curious about the rediscovered symphony in B flat, makes a valid alternative. The recording is beautifully clear and does not pull any punches with the chunky writing for brass. Rachel Nicholls is not drowned by the orchestra hammering away behind her. The booklet notes by Oliver Soden are very helpful; his new biography of the composer will be out shortly. This release, together with its predecessor, can now take its place as the standard recommendation for Tippett’s symphonies, and they deserve every success.